We put together a quick-hit sort of map on Wednesday afternoon. The Office of the Independent Police Review Director released a report on the conduct of police officers during the G20. 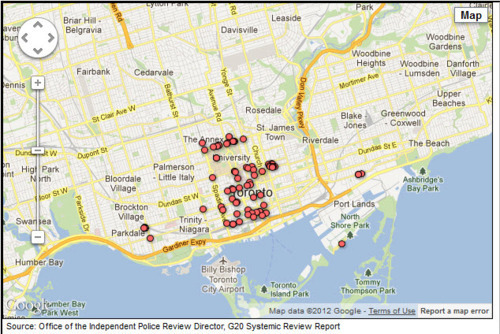 In that report was a list of incidents where police officers stopped and searched individuals around downtown Toronto. Since the report contained locations for each incident, we decided to map them, with the caveat that it is definitely not a comprehensive list of all the stops and searches that happened in Toronto that weekend. You can see that there were a lot of incidents along Bloor Street, in Parkdale and the east end – well away from the downtown security fence.